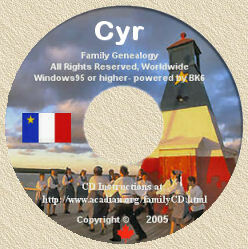 Acadian Genealogy Homepage; Bourgeois Family! With de Razilly, he first settled at La Hève, on the southern coast of present day Nova Scotia. In 1636, after the death of Razilly, the new governor, Charles de Menou d'Aulnay abandoned La Hève and re-established the colony at Port Royal to the northwest. One of Jacques' sons, Robert, either came with his father to Acadie or else joined him later. Jacques would later serve as lieutenant of the garrison at Port Royal under Germain Doucet. Robert Bourgeois was also an officer of the garrison. In 1646, the Governor d'Aulnay granted Jacques and Jeanne Bourgeois an island called Isle aux Cochons situated in the Dauphin River (today called the Annapolis River) just upstream from Port Royal. 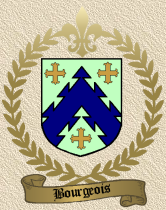 In 1671, Jacques, aided by his three sons and his son in law, Pierre SIRE, and his future son in law, Jean Boudrot, founded the settlement of Beaubassin, near the border separating present day New Brunswick from Nova Scotia. Jacques and his son, Guillaume, returned to live at Port Royal after the establishment at Beaubassin, although they kept farms at the new settlement. Jacques' other two sons, Charles and Germain, stay at Beaubassin with their families. In 1686, Jacques and Jeanne moved definitively to Beaubassin to live with their son, Germain. On Oct. 15, 1687, Jacques Bourgeois signed a document, along with others, attesting to the works of the ex-governor d'Aulnay in the colony. At the beginning of Sept. 1696, the English Colonel Benjamin Church from Boston attacked Beaubassin, which has been left undefended by the French. Jacques is enlisted to negotiate with the English contingent from Boston. Jacques obtained a promise from Church that the residents would be left in peace, but Church reneged on his promise and the soldiers from Boston burned most of the homes in the region. The Acadians of Beaubassin were forced to flee to the woods; however, the English respected the Acadians' capabilities as marksmen and refused to chase the Acadians out of the reach of their ship's cannons. At the time of the deportation in 1755, many of Jacques' grandchildren were deported to the American colonies where they suffered greatly. Some eventually made their way back to Canada, and the Bourgeois name is common today in southeastern New Brunswick. Others made their way to Louisiana during the mid-1760's. At least nine Bourgeois men settled on the east bank of the Mississippi River in St. James Parish. Five of these, Paul, Joseph, Michel, Pierre and Jean-Baptiste, were brothers, the sons of Paul Bourgeois and Marie-Josephe Brun, originally of Beaubassin, Acadia. From this group came a number of successful sugar planters in St. James Parish. Beginning in the 1790's and continuing into the 1820's, some of the children and grandchildren of the original Bourgeois settlers moved to Bayou LaFourche. Most settled below Thibodaux. You can join the international Bourgeois family association, "L'Association des Bourgeois d'Amerique" and receive their newsletter by sending $10 to Paul-Pierre Bourgeois; C.P. 117; Grand-Digue, N-B, EOA 1S0, Canada. "I copied this from the cited source this morning, and made every attempt to spell each name as printed. Hopefully, you can find the appropriate place to post it for other researchers use. I also plan to post it to the Cajun roots newslist. Please let me know if you can use additional info like this in the future". "I have not had an opportunity to check out the relationship of this family to that of my wife's earliest Bourgeois who was born in St. James Parish, LA in 1802. I would love to hear from anyone, though, that can help me connect her Thomas D'Aquin Bourgeois (married Marie Celeste Matherne, 8 Feb 1831) to any of the nine Bourgeois men named in the article that came to Louisiana". NOTE I am grateful to Jason Bourgeois [[email protected]] for having provided me the following corrected information which was subsequently published in the October 6, 1996 Daily Advertiser under the heading "Bourgeois Update". "Paul-Pierre Bourgeois of Grande-Digue, New Brunswick, points out new information refuting the view that a Jacques Bourgeois, father, and Jacques Bourgeois, son, both came to Acadie in the early 1600's. Rather, a single Jacques Bourgeois, the surgeon, arrived in 1641 aboard the St-Francois from La Rochelle. According to Paul-Pierre Bourgeois and René Perron, Jacques Bourgeois was most likely born in 1620 or 1621 in La Ferte-Gaucher near Paris as the illegitimate son of a widow, Marguerite Bourgeois Grandjehn and raised under the maiden name of his mother. Jacques was apparently trained as a surgeon by the Order of Malta. You may order a copy of Pierre-Paul Bourgeois' bilingual book A la recherche des Bourgeois d'Acadie, from La Societé Historique de Grande-Digue, C.P. 117, Grande-Digue, N.B. E0A 1S0, Canada."